If this was to be the last Cup tie played on this old ground, it was a fittingly dramatic one to finish, both cruel and joyous in equal measure. After 121 long minutes, Angelo Ogbonna rose at the death to head West Ham into the fifth round and break the young hearts of Liverpool. It is Slaven Bilic�s side who progress to play Blackburn Rovers but, in a week where the cost of football has been in acute focus, it is fair to say that both sets of fans got their money�s worth. Liverpool will be glad of Daniel Sturridge�s impressive return from injury, but the profligacy of Christian Benteke late on ensured an exit for a fledgling side that had performed admirably in the face of a high-octane display by the Hammers. 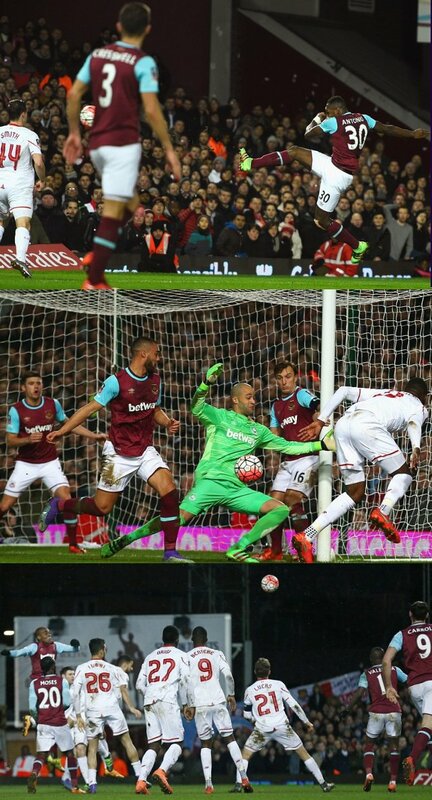 Michail Antonio had given West Ham the lead just before half-time, but Philippe Coutinho�s free-kick crept under the wall to equalise three minutes into the second half. From thereon in, the game ebbed and flowed with chances for both sides, until Ogbonna rose in the dying moments to head Dimitri Payet�s cross over Simon Mignolet and in. Yet while Klopp lamented the result, Bilic was jubilant. Blackburn have been on a poor run in the Championship and, with a quarter-final place in this competition a real possibility, the chance to secure a trophy in their final campaign at Upton Park remains alive. Both sides made significant changes from their previous league matches. Mignolet was the only player who remained in Liverpool�s starting lineup from the 2-2 draw against Sunderland, while West Ham made five alterations from the team who lost narrowly at Southampton. Klopp�s was a youthful selection and, most notably, Lucas Leiva started in central defence alongside Tiago Ilori. Coutinho was involved throughout a first half during which posts were hit and goalkeepers tested. Payet was a constant threat to a Liverpool defence containing Jon Flanagan and Brad Smith as full-backs, but the white shirts had plenty of attacking gusto themselves. Smith�s deflected ball across goal from the byline fell to the young midfielder João Teixeira, whose shot flew narrowly wide. Coutinho then came even closer for Liverpool, hitting the post after Benteke showed quick feet to beat his marker and find his team-mate in the 34th minute. The woodwork was rattled at the other end soon after, Payet�s curled free-kick from the edge of the �D� beating Mignolet but not his left-hand post, and the goalkeeper produced a smart save to keep out Antonio from the rebound. Antonio, though, was not going to be denied for long. With one minute until half-time, Enner Valencia retrieved the ball just outside the area on the left. The Ecuadorian beat a cluster of white shirts before drifting a precise ball to the far post, where Antonio volleyed in. Unfortunately for West Ham, the lead had gone three minutes into the second half. Benteke was caught in a bundle of claret and blue on the edge of the area and, despite the protestations from the home crowd, the referee, Roger East, awarded a free-kick. Up stepped Coutinho. It seemed too close to goal to get a shot up and over but the Brazilian did not need to. Instead, he hit a grass-cutter under the wall and past Randolph. The intensity increased. Valencia went down in the opposition penalty area and appeared to be dragged back by Ilori, but despite the appeals inside the stadium and Bilic�s gesticulations, the referee ignored the penalty claims. In the closing stages Sturridge nutmegged Joey O�Brien to win a free-kick, which Randolph saved from Benteke, but it was to be Ogbonna who had the final word. Bilic said: �I can�t control the emotions. I don�t want to control them totally. It is a special night. There is no harm in saying it�s a special night for our club. We�re so proud and happy for our players. It is a great night for West Ham.